Karen Hudes seems to think Fukushima was intentional. Skip to timestamp 53:02. How a nuclear plant works. Click image to enlarge in new tab. A senior adviser to the operator of the wrecked Fukushima Daiichinuclear power plant has told the firm that it may have no choice but to eventually dump hundreds of thousands of tonnes of contaminated waterinto the Pacific Ocean. Speaking to reporters who were on a rare visit to the plant on the eve of the third anniversary of the March 2011 earthquake, tsunami and nuclear disaster, Dale Klein said Tokyo Electric Power [Tepco] had yet to reassure the public over the handling of water leaks that continue to frustrate efforts to clean up the site. “The one issue that keeps me awake at night is Tepco’s long-term strategy for water management,” said Klein, a former chairman of the US nuclear regulatory commission who now leads Tepco’s nuclear reform committee. “Storing massive amounts of water on-site is not sustainable. A controlled release is much safer than keeping the water on-site. Tepco’s failure to manage the buildup of contaminated water came to light last summer, when it admitted that at least 300 tonnes of tainted water were leaking into the sea every day. That revelation was followed by a string of incidents involving spills from poorly assembled storage tanks, prompting the government to commit about $500m (£300m) into measures to contain the water. They include the construction of an underground frozen wall to prevent groundwater mixing with contaminated coolant water, which becomes tainted after coming into contact with melted nuclear fuel deep inside the damaged reactors. Tepco confirmed that it would activate an experimental wall at a test site at the plant on Tuesday. If the test is successful, the firm plans to build a similar structure almost 2km in length around four damaged reactors next year, although some experts have questioned its ability to use the technology on such a large scale. Klein, too, voiced scepticism over the frozen wall solution, and suggested that the controlled release of treated water into the Pacific was preferable to storing huge quantities of it on site. But Tepco, the government and nuclear regulators would have to win the support of local fishermen, and the release of even treated water would almost certainly draw a furious response from China and South Korea. Tepco is pinning its hopes on technology that can remove dozens of dangerous radionuclides, apart from tritium, internal exposure to which has been linked to a greater risk of developing cancer. Klein, however, said tritium does not pose the same threat to heath as bone-settling strontium and caesium, and can be diluted to safe levels before it is released into the sea. The Fukushima Daiichi plant’s manager, Akira Ono, said the firm had no plans to release contaminated water into the Pacific, but agreed that decommissioning would remain on hold until the problem was solved. “The most pressing issue for us is the contaminated water, rather than decommissioning,” he said. “Unless we address this issue the public will not be assured and the evacuees will not be able to return home. For visitors and workers alike, the journey to the plant begins at J-Village, a former training complex for the Japanese football team that now serves as the Fukushima cleanup’s logistical base. During the 20-minute bus ride through neighbourhoods still bearing the scars of the earthquake and tsunami, there were signs that decontamination work is making modest progress. Atmospheric radiation levels are falling, leading the authorities to partially lift evacuation orders in neighbourhoods on the edge of the evacuation zone. Some of Fukushima’s 100,000-plus nuclear evacuees are now permitted to return to their homes during the day, but radiation levels are still too high for them to make a permanent return. In the town of Naraha, where atmospheric radiation hovered around 2 microsieverts an hour on Monday – the official decontamination target is 0.23 microsieverts an hour – large black bags filled with radioactive soil cover fields once used for agriculture, where they will remain until agreement can be reached on a permanent disposal site. Part of a railway line running along to coast is due to reopen in the spring, although stretches of track that pass through the most contaminated areas are expected to remain closed for years. Inside Fukushima Daiichi, reporters were reminded of the frantic attempts by a small group of Tepco engineers to save the plant from an even greater catastrophe in the hours after its power supply was knocked out by a towering tsunami three years ago. In the control room for reactors 1 and 2, both of which suffered meltdowns, one worker’s attempts to record water levels by scribbling them on to a disabled control panel are still visible. None of the unnamed men, who had to work by torchlight, are still at the site: some have retired, but most had to leave because they quickly reached their lifetime radiation dose limit. Different people have different opinions of the nuclear power industry. Some see nuclear power as an important green technology that emits no carbon dioxide while producing huge amounts of reliable electricity. They point to an admirable safety record that spans more than two decades. Others see nuclear power as an inherently dangerous technology that poses a threat to any community located near a nuclear power plant. They point to accidents like the Three Mile Island incident and the Chernobyl explosion as proof of how badly things can go wrong. In either case, commercial nuclear reactors are a fact of life in many parts of the developed world. Because they do make use of a radioactive fuel source, these reactors are designed and built to the highest standards of the engineering profession, with the perceived ability to handle nearly anything that nature or mankind can dish out. Earthquakes? No problem. Hurricanes? No problem. Direct strikes by jumbo jets? No problem. Terrorist attacks? No problem. Strength is built in, and layers of redundancy are meant to handle any operational abnormality. Shortly after an earthquake hit Japan on March 11, 2011, however, those perceptions of safety began rapidly changing. Explosions rocked several different reactors in Japan, even though initial reports indicated that there were no problems from the quake itself. Fires broke out at the Onagawa plant, and there were explosions at the Fukushima Daiichi plant. So what went wrong? How can such well-designed, highly redundant systems fail so catastrophically? Let’s take a look. If you have read How Nuclear Reactors Work, you are familiar with the basic idea behind a nuclear power plant. At a high level, these plants are quite simple. Nuclear fuel, which in modern commercial nuclear power plants comes in the form of enriched uranium, naturally produces heat as uranium atoms split (see the Nuclear Fission section of How Nuclear Bombs Work for details). The heat is used to boil water and produce steam. The steam drives a steam turbine, which spins a generator to create electricity. These plants are large and generally able to produce something on the order of a gigawatt of electricity at full power. In order for the output of a nuclear power plant to be adjustable, the uranium fuel is formed into pellets approximately the size of a Tootsie Roll. These pellets are stacked end-on-end in long metal tubes called fuel rods. The rods are arranged into bundles, and bundles are arranged in the core of the reactor. Control rods fit between the fuel rods and are able to absorb neutrons. If the control rods are fully inserted into the core, the reactor is said to be shut down. The uranium will produce the lowest amount of heat possible (but will still produce heat). If the control rods are pulled out of the core as far as possible, the core produces its maximum heat. Think about the heat produced by a 100-watt incandescent light bulb. These bulbs get quite hot — hot enough to bake a cupcake in an Easy Bake oven. Now imagine a 1,000,000,000-watt light bulb. That is the kind of heat coming out of a reactor core at full power. The reactors that failed in Japan are Mark 1 boiling water reactors designed by General Electric in the 1960s. This is one of the earlier reactor designs, in which the uranium fuel boils water that directly drives the steam turbine. This design was later replaced by pressurized water reactors because of safety concerns surrounding the Mark 1 design. As we have seen, those safety concerns turned into safety failures in Japan. Let’s take a look at the fatal flaw that led to disaster. A boiling water reactor has an Achilles heel — a fatal flaw — that is invisible under normal operating conditions and most failure scenarios. The flaw has to do with the cooling system. A boiling water reactor boils water: That’s obvious and simple enough. It’s a technology that goes back more than a century to the earliest steam engines. As the water boils, it creates a huge amount of pressure — the pressure that will be used to spin the steam turbine. The boiling water also keeps the reactor core at a safe temperature. When it exits the steam turbine, the steam is cooled and condensed to be reused over and over again in a closed loop. The water is recirculated through the system with electric pumps. The design’s vulnerability comes into play if the electric pumps lose power. Without a fresh supply of water in the boiler, the water continues boiling off, and the water level starts falling. If enough water boils off, the fuel rods are exposed and they overheat. At some point, even with the control rods fully inserted, there is enough heat to melt the nuclear fuel. This is where the term meltdown comes from. Tons of melting uranium flows to the bottom of the pressure vessel. At that point, it’s catastrophic. In the worst case, the molten fuel penetrates the pressure vessel gets released into the environment. Because of this known vulnerability, there is huge redundancy around the pumps and their supply of electricity. There are several sets of redundant pumps, and there are redundant power supplies. Power can come from the power grid. If that fails, there are several layers of backup diesel generators. If they fail, there is a backup battery system. With all of this redundancy, it seems like the vulnerability is completely covered. There is no way for the fatal flaw to ever be exposed. Unfortunately, shortly after the earthquake, the worst-case scenario unfolded. The worst-case scenario in Japan’s nuclear crisis would be a meltdown and a massive release of nuclear radiation into the environment. The nuclear power plants in Japan weathered the earthquake itself without difficulty. The four plants nearest the quake’s epicenter shut down automatically, meaning that the control rods were fully inserted into their reactor cores and the plants stopped producing power. This is normal operating procedure for these plants, but it meant that the first source of electricity for the cooling pumps was gone. That isn’t a problem because the plant could get power from the power grid to run the pumps. However, the power grid became unstable and it shut down as well. The second source of electricity for the cooling pumps was gone. That brought the backup diesel generators into play. Diesel generators are a robust and time-tested way to generate electricity, so there were no worries. But then the tsunami hit. And unfortunately, the tsunami was far larger than anyone had planned for. If the backup diesel generators had been higher off the ground, designed to run while submerged in water or protected from deep water in some way, the crisis could have been averted. Unfortunately, the unexpected water levels from the tsunami caused the generators to fail. This left the last layer of redundancy — batteries — to operate the pumps. The batteries performed as expected, but they were sized to last for only a few hours. The assumption, apparently, was that electricity would become available from another source fairly quickly. Although operators did truck in new generators, they could not be hooked up in time, and the coolant pumps ran out of electricity. The fatal flaw in the boiling water design — thought to be impossible to uncover through so many layers of redundancy — had nonetheless become exposed. With it exposed, the next step in the process led to catastrophe. With the batteries dead, the coolant pumps failed. With no fresh coolant flowing into the reactor core, the water that kept it cool began boiling off. As the water boiled away, the tops of the fuel rods were exposed, and the metal tubes holding the uranium fuel pellets overheated and cracked. The cracks allowed water to enter the tubes and get to the fuel pellets, where it began generating hydrogen gas. The process is called thermolysis — if you get water hot enough, it breaks down into its constituent hydrogen and oxygen atoms. Hydrogen is a highly explosive gas — recall the Hindenburg explosion, in which the Hindenburg was full of hydrogen gas. In Japan’s nuclear plants, pressure from the hydrogen built up, and the gas had to be vented. Unfortunately, so much hydrogen vented so quickly that it exploded inside the reactor building. This same chain of events unfolded in several different reactors. The explosions did not rupture the pressure vessels holding the nuclear cores, nor did they release any significant amounts of radiation. These were simple hydrogen explosions, not nuclear explosions. The explosions damaged the concrete and steel buildings surrounding the pressure vessels. The explosions also indicated that things had gotten out of control. If water were to continue boiling off, a meltdown would be almost assured. So operators decided to flood the reactors with seawater. This is a last-ditch effort to control the situation, since seawater completely ruins a reactor, but it’s better than a meltdown. In addition, the seawater was mixed with boron to act something like a liquid version of the control rods. Boron absorbs neutrons and is one of the main constituents in the control rods. Tricastin Nuclear Power Plant is one of 59 French plants that provide 75 percent of the country’s electricity.
. Obviously, it’s a serious situation.
. That capacity will need to be replaced in some way. At 40 years old, these reactors are nearing the end of their design lifespans anyway. One alternative is to simply rebuild the plants. The two problems with this approach are that it will be a very lengthy process — possibly taking a decade or more — and the general public in Japan may have no appetite for new nuclear reactors. It is still too early to tell. There are a number of Mark 1 reactors in the United States. It is certain that they will be decommissioned or altered to take advantage of the lessons learned in Japan. Other reactors may also be altered as needed. The nuclear industry was hoping for a renaissance of nuclear power in the United States now that more than three decades have elapsed since the Three Mile Island incident shut down new nuclear plant construction in the United States. The events in Japan may stop this renaissance. Or they may spur research in other, possibly safer, nuclear technologies. You’ve probably heard people talk about radiation both in fiction and in real life. For example, when the Enterprise approaches a star on “Star Trek,” a member of the crew might warn about an increase in radiation levels. In Tom Clancy’s book “The Hunt for Red October,” a Russian submarine has a nuclear reactor accident with radiation leakage that forces the crew to abandon ship. At Three Mile Island and Chernobyl, nuclear power plants released radioactive substances into the atmosphere during nuclear accidents. And in the aftermath of the March 2011 earthquake and tsunami that struck Japan, a nuclear crisis raised fears about radiation and questions about the safety of nuclear power. All of these terms are related by the fact that they all have something to do with nuclear elements, either natural or man-made. But what exactly is radiation? Why is it so dangerous? In this article, we will look at nuclear radiation so that you can understand exactly what it is and how it affects your life on a daily basis. L­e­t’s start at the beginning and understand where the word “nuclear” in “nuclear radiation” comes from. Here is something you should already feel comfortable with: Everything is made of atoms. Atoms bind together into molecules. So a water molecule is made from two hydrogen atoms and one oxygen atom bound together into a single unit. Because we learn about atoms and molecules in elementary school, we understand and feel comfortable with them. In nature, any atom you find will be one of 92 types of atoms, also known as elements. So every substance on Earth — metal, plastics, hair, clothing, leaves, glass — is made up of combinations of the 92 atoms that are found in nature. The Periodic Table of Elements you see in chemistry class is a list of the elements found in nature plus a number of man-made elements. Inside every atom are three subatomic particles: protons, neutrons and electrons. Protons and neutrons bind together to form the nucleus of the atom, while the electrons surround and orbit the nucleus. Protons and electrons have opposite charges and therefore attract one another (electrons are negative and protons are positive, and opposite charges attract), and in most cases the number of electrons and protons are the same for an atom (making the atom neutral in charge). The neutrons are neutral. Their purpose in the nucleus is to bind protons together. Because the protons all have the same charge and would naturally repel one another, the neutrons act as “glue” to hold the protons tightly together in the nucleus. The number of protons in the nucleus determines the behavior of an atom. For example, if you combine 13 protons with 14 neutrons to create a nucleus and then spin 13 electrons around that nucleus, what you have is an aluminum atom. If you group millions of aluminum atoms together you get a substance that is aluminum — you can form aluminum cans, aluminum foil and aluminum siding out of it. All aluminum that you find in nature is called aluminum-27. The “27” is the atomic mass number — the sum of the number of neutrons and protons in the nucleus. If you take an atom of aluminum and put it in a bottle and come back in several million years, it will still be an atom of aluminum. Aluminum-27 is therefore called a stable atom. Up to about 100 years ago, it was thought that all atoms were stable like this. Americium-241, a radioactive element best known for its use in smoke detectors, is a good example of an element that undergoes alpha decay. An americium-241 atom will spontaneously throw off an alpha particle. An alpha particle is made up of two protons and two neutrons bound together, which is the equivalent of a helium-4 nucleus. In the process of emitting the alpha particle, the americium-241 atom becomes a neptunium-237 atom. The alpha particle leaves the scene at a high velocity — perhaps 10,000 miles per second (16,000 km/sec). If you were looking at an individual americium-241 atom, it would be impossible to predict when it would throw off an alpha particle. However, if you have a large collection of americium atoms, then the rate of decay becomes quite predictable. For americium-241, it is known that half of the atoms decay in 458 years. Therefore, 458 years is the half-life of americium-241. Every radioactive element has a different half-life, ranging from fractions of a second to millions of years, depending on the specific isotope. For example, americium-243 has a half-life of 7,370 years. Tritium (hydrogen-3) is a good example of an element that undergoes beta decay. In beta decay, a neutron in the nucleus spontaneously turns into a proton, an electron, and a third particle called an antineutrino. The nucleus ejects the electron and antineutrino, while the proton remains in the nucleus. The ejected electron is referred to as a beta particle. The nucleus loses one neutron and gains one proton. Therefore, a hydrogen-3 atom undergoing beta decay becomes a helium-3 atom. In spontaneous fission, an atom actually splits instead of throwing off an alpha or beta particle. The word “fission” means “splitting.” A heavy atom like fermium-256 undergoes spontaneous fission about 97 percent of the time when it decays, and in the process, it becomes two atoms. For example, one fermium-256 atom may become a xenon-140 and a palladium-112 atom, and in the process it will eject four neutrons (known as “prompt neutrons” because they are ejected at the moment of fission). These neutrons can be absorbed by other atoms and cause nuclear reactions, such as decay or fission, or they can collide with other atoms, like billiard balls, and cause gamma rays to be emitted. Neutron radiation can be used to make nonradioactive atoms become radioactive; this has practical applications in nuclear medicine. Neutron radiation is also made from nuclear reactors in power plants and nuclear-powered ships and in particle accelerators, devices used to study subatomic physics. In many cases, a nucleus that has undergone alpha decay, beta decay or spontaneous fission will be highly energetic and therefore unstable. It will eliminate its extra energy as an electromagnetic pulse known as a gamma ray. Gamma rays are like X-rays in that they penetrate matter, but they are more energetic than X-rays. Gamma rays are made of energy, not moving particles like alpha and beta particles. While on the subject of various rays, there are also cosmic rays bombarding the Earth at all times. Cosmic rays originate from the sun and also from things like exploding stars. The majority of cosmic rays (perhaps 85 percent) are protons traveling near the speed of light, while perhaps 12 percent are alpha particles traveling very quickly. It is the speed of the particles, by the way, that gives them their ability to penetrate matter. When they hit the atmosphere, they collide with atoms in the atmosphere in various ways to form secondary cosmic rays that have less energy. These secondary cosmic rays then collide with other things on Earth, including humans. We get hit with secondary cosmic rays all of the time, but we are not injured because these secondary rays have lower energy than primary cosmic rays. Primary cosmic rays are a danger to astronauts in outer space. Alth­ough they are “natural” in the sense that radioactive atoms naturally decay and radioactive elements are a part of nature, all radioactive emissions are dangerous to living things. Alpha particles, beta particles, neutrons, gamma rays and cosmic rays are all known as ionizing radiation, meaning that when these rays interact with an atom they can knock off an orbital electron. The loss of an electron can cause problems, including everything from cell death to genetic mutations (leading tocancer), in any living thing. As we have seen, radioactivity is “natural,” and we all contain things like radioactive carbon-14. There are also a number of man-made nuclear elements in the environment that are harmful. Nuclear radiation has powerful benefits, such as nuclear power to generate electricity and nuclear medicine to detect and treat disease, as well as significant dangers. On one hand, atomic energy offers a clean energy alternative that frees us from the shackles of fossil fuel dependence. On the other, it summons images of disaster: quake-ruptured Japanese power plants belching radioactive steam, the dead zone surrounding Chernobyl’s concrete sarcophagus.
. In the United States, 104 nuclear power plants supply 20 percent of the electricity overall, with some states benefiting more than others. In this article, we’ll look at just how a nuclear reactor functions inside a power plant, as well as the atomic reaction that releases all that crucial heat. Uranium-235 isn’t the only possible fuel for a power plant. Another fissionable material is plutonium-239. Plutonium-239 is created by bombarding U-238 with neutrons, a common occurrence in a nuclear reactor. While older plants burn fossil fuels, nuclear plants depend on the heat that occurs during nuclear fission, when one atom splits into two and releases energy. Nuclear fission happens naturally every day. Uranium, for example, constantly undergoes spontaneous fission at a very slow rate. This is why the element emits radiation, and why it’s a natural choice for the induced fissionthat nuclear power plants require. The animation to the right shows a uranium-235 nucleus with a neutron approaching from the top. As soon as the nucleus captures the neutron, it splits into two lighter atoms and throws off two or three new neutrons (the number of ejected neutrons depends on how the U-235 atom splits). The process of capturing the neutron and splitting happens very quickly. Stick with us. We’ll head inside the power plant and investigate the reactor next. This diagram shows all the parts of a nuclear reactor. Take a tour of the inside of a nuclear power plant. Given all the radioactive elements inside a nuclear power plant, it shouldn’t come as a surprise that there’s a little more to a plant’s outside than you’d find at a coalpower plant. In the next section, we’ll explore the various protective barriers between you and the atomic heart of the plant. As you can tell by looking at this photograph of Germany’s Brokdorf nuclear plant, concrete plays an important role in containing radioactive materials. Once you get past the reactor itself, there’s very little difference between a nuclear power plant and a coal-fired or oil-fired power plant, except for the source of th­e heat used to createsteam. But as that source can emit harmful levels of radiation, extra precautions are required. A concrete liner typically houses the reactor’s pressure vessel and acts as a radiation shield. That liner, in turn, is housed within a much larger steel containment vessel. This vessel contains the reactor core, as well as the equipment plant workers use to refuel and maintain the reactor. The steel containment vessel serves as a barrier to prevent leakage of any radioactive gases or fluids from the plant. An outer concrete building serves as the final layer, protecting the steel containment vessel. This concrete structure is designed to be strong enough to survive the kind of massive damage that might result from earthquakes or a crashing jet airliner. These secondary containment structures are necessary to prevent the escape of radiation/radioactive steam in the event of an accident. The absence of secondary containment structures in Russian nuclear power plants allowed radioactive material to escape in Chernobyl. As you probably know, nuclear power has its share of critics, as well as its supporters. On the next page, we’ll take a quick look at some of the pros and cons of splitting an ­atom to keep everyone’s TVs and toasters running. What’s nuclear power’s biggest advantage? It doesn’t depend on fossil fuels and isn’t affected by fluctuating oil and gas prices. Coal and natural gas power plants emit carbon dioxide into the atmosphere, which contributes to climate change. With nuclear power plants, CO2emissions are minimal. And then there are the negatives. Historically, mining and purifying uranium hasn’t been a very clean process. Even transporting nuclear fuel to and from plants poses a contamination risk. And once the fuel is spent, you can’t just throw it in the city dump. It’s still radioactive and potentially deadly. All of this waste emits radiation and heat, meaning that it will eventually corrode any container that holds it. It can also prove lethal to nearby life forms. As if this weren’t bad enough, nuclear power plants produce a great deal of low-level radioactive waste in the form of radiated parts and equipment. Over time, spent nuclear fuel decays to safe radioactive levels, but this process takes tens of thousands of years. 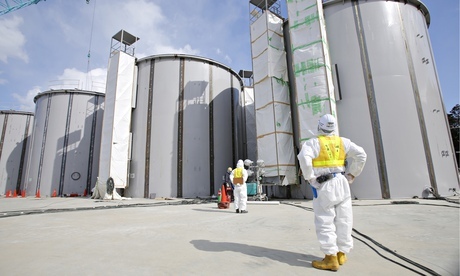 Even low-level radioactive waste requires centuries to reach acceptable levels. Currently, the nuclear industry lets waste cool for years before mixing it with glass and storing it in massive cooled, concrete structures. This waste has to be maintained, monitored and guarded to prevent the materials from falling into the wrong hands. All of these services and added materials costmoney — on top of the high costs required to build a plant. Chernobyl was poorly designed and improperly operated. The plant required constant human attention to keep the reactor from malfunctioning. Meanwhile, modern plants require constant supervision to keep from shutting down. Yet even a well-designed nuclear power plant is susceptible to natural disaster. On Friday, March 11, 2011, Japan suffered the largest earthquake in modern history. A programmed response at the country’s Fukushima-Daiichi nuclear facility immediately descended all of the reactor’s control rods, shutting down all fission reactions within ten minutes. Unfortunately, however, you can’t shut down all radioactivity with the flip of a switch. The March 2011 quake manifested a deadly tsunami, which destroyed the backup diesel generators that powered the water coolant pumps and that the facility had turned to after it couldn’t get power from Japan’s grid. These pumps circulate water through the reactor to remove decay heat. Uncirculated, both the water temperature and water pressure inside the reactor continued to rise. Furthermore, the reactor radiation began to split the water into oxygen and volatile hydrogen. The resulting hydrogen explosions breached the reactor building’s steel containment panels. Simply put, the Fukushima-Daiichi facility had many countermeasures in place to shut down operations in the event of severe seismic activity. They just didn’t count on losing power to their coolant pumps. Plants such as Japan’s Fukushima-Daiichi facility, Russia’s Chernobyl and the United States’ Three Mile Island remain a black eye for the nuclear power industry, often overshadowing some of the environmental advantages the technology has to offer. You can read more about exactly what happened in How Japan’s Nuclear Crisis Works.